Can you imagine lifting two baby elephants together? Well, this might sound unbelievable to you but that’s what ‘Gama, The Great’ did at the age of 24, lifting a rock weighing 1,200 kg. This man with massive strength and energy lived in Lahore near Mohni road and did wrestling in one of the wrestling arenas inside Bhatti Gate of Lahore Walled City. Bhatti Gate has been known for housing many legends and the Great Gama is one of them. The Great Gama shifted to Lahore (Pakistan) in 1947 and stayed here until his death. Today many of the wrestling arenas have vanished from the walled city of Lahore but the remains are still there. The connection of Great Gama with Lahore and Bhatti Gate cannot be forgotten. Even today the wrestlers look up to the Great Gama and wish to be like him. Let me take you to a brief introduction of who Gama was. He was known as Rustam-e-Hind (Champion of India) and Rustam-e-Zaman (Champion of the Universe). These titles are given to Gama Pehalwan always fall short in describing his person and his awesome proficiency in wrestling. Such is his legacy that even so many years after his passing away, every wrestler in India and Pakistan aspires to be like Gama – the Undefeated, never having lost a single bout. He was a great sportsman and a humble human being. Gama Pehalwan was far above the little concerns of religion, caste, creed and all the things that divide human beings. The example of it came during the bloody riots that marked the partition of India and Pakistan. Gama, a Muslim by faith saved hundreds of Hindus of his colony in Lahore from the ferocious mob. Ghulam Muhammad later known as the Gama Pehalwan was born in a Kashmiri family in Amritsar on May 22, 1878. He was most famous for long and successful wrestling career as he remained undefeated for more than 50 years, but his training methods and feats of strength he used to perform also played a role in his popularity. Gama Pehalwan was trained by his father, who was also an unbeaten wrestler, at a very young age. The public at large noticed Gama when he appeared at a strongman competition at the age of ten. With more than 400 wrestlers and participants in that competition (which featured many tough exercises, like Indian squats), Gama Pehalwan managed to secure his place among the last fifteen wrestlers. Since he showed incredible dedication and stamina for his age, The Great Gama was announced a winner of that competition. Only nine years later, The Great Gama issued a challenge against the Indian wrestling champion Raheem Baksh, who was much taller than him. Gama himself having a structure of 5’7″ fought with a 7 feet tall opponent. Historians and people say that Raheem had an advantage of height against Gama in that match but still Gama managed to win the fight which marked the turning point in his career. This was the time Gama Pehalwan gained popularity and became famous among the masses. People from every far-flung area would come to attend the wrestling of Gama Pehalwan. It is said in the history of wrestling that in 1910, when Gama flew to England with his wrestler-brother Imam Baksh, he was not allowed to enter the arena of the international championship. He challenged that he could defeat any wrestler there and then managed to defeat the American champion Benjamin Roller in just 1 minute, 40 seconds. This was the strength of the Great Gama. Stanislaus Zbyszko, a Polish champion, was his next opponent who realized, a minute into the match that Gama was too powerful for him and stayed pinned to the mat for the next 2 hours, 35 minutes. This was seen as disgraceful by the wrestling community and Gama challenged Zbyszko to a rematch for which he didn’t show up. So, Gama was finally named the international champion. Should this man be forgotten? 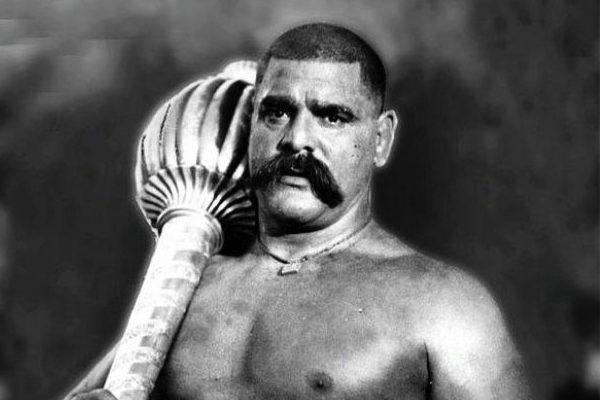 At the age of 22, the Great Gama traveled to Baroda to compete in wrestling. Unfortunately, he couldn’t find a match and decided to do something else instead. He lifted 1200kg stone (2645 pounds) up to his chest and dropped it down after carrying it for a while. It was 2.5 feet in height and it’s still on display at the Baroda Museum. Wrestlers are known to be tough and muscular, but Gama was strong way beyond words and imagination. In the present world, I don’t think so that we can have someone as Gama again. It is said that his exercise included five thousand squats and three thousand pushups every day. Well, this sounds impossible to me but the Great Gama did it. Another breathtaking fact about him is off the diet he took. Gama would daily have 10 liters of milk, half a kilogram of butter, six chickens, and four kilos of fruit and a pound and a half of crushed almond paste made into a tonic drink. Well, despite all his services for wrestling and making us proud about the fact that he spent his life here in Lahore, the heart of Pakistan, what disturbs me is that we did not pay him back the way we should have. Did we pass on this intangible culture to our new generations? The name of Gama would be alien to many of us and I think we should be ashamed on this. It is our duty to keep these legends alive. The connection of Gama and Lahore should be highlighted and our new generations should be told about this art of wrestling and its roots. Today many of the ages-old wrestling arenas inside the Walled City have been closed, maybe the people are no more taking interest in this art. In my opinion, this art of wrestling is our culture and we need to preserve it before it fades away like many other facets of our intangible culture.